Our brains are organized to ensure our survival. The human brain is often conceptualized to comprise three parts: the oldest part, the reptilian brain (found in the brain stem), the mid-section, the mammalian brain (limbic system), and the most recently evolved part, the rational or cognitive brain (pre-frontal cortex). When the brain’s alarm system is turned on, stress chemicals (adrenaline and cortisol) are secreted and the two older sections of the brain (together often referred to as the the emotional brain) take over and shut down parts of the more recently evolved prefrontal cortex. The body is then compelled to run, hide, fight or freeze in response to the perceived threat. The job of the emotional brain is to set in motion these pre-programmed escape/safety plans in order to keep you safe. The muscular and physiological responses associated with these safety plans are automatic. They do not require any thought or planning on your part. They just happen. 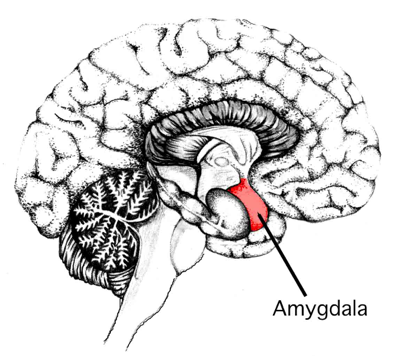 A key part of the emotional brain is called the amygdala. It can be thought of as the “alarm central” of the brain. When threat is perceived by a person, the amygdala sends signals to other parts of the emotional brain to initiate the stress hormone system and the autonomic nervous system (ANS) to orchestrate a whole-body response to what is perceived as a threat to survival. The stress hormones (adrenaline and cortisol) increase heart rate, blood pressure and rate of breathing to prepare you to respond to the threat. When someone is having a panic attack all of these responses kick into play. It doesn’t matter that there may be no “real threat”, a perceived threat is enough to set in motion the neuro-physiology described above. Part of learning how to manage a panic attack involves developing the capacity to re-engage the pre-frontal cortex to assuage the emotional brain. This will be discussed in a future post.